Being a lipstick lover and a lipstick hoarder it is very obvious that my blog posts are mostly based on lipsticks reviews and swatches. So, today's talk of the post is newly launched PLUSH HOUR MATTE LIPSTICKS by SUGAR COSMETICS. As Sugar cosmetics coming up with one after another bang on products. And I am till now so much impressed with this brand that with every new launch I am falling in love with the brand. Price:- Rs.499/- each for 3.9g. 01 CHERRY JANE (oh what a red...perfect for all skin tones!). 02 TEAKER BELL (little different shade but I am loving it...!). 03 MINNIE MAUVE (that's a pretty shade indeed...!). 04 POWERBUFF GIRLS (cute name!!!). 05 BERRY BOOP (perfect shade for fall!!!). 06 LITTLE BO PEACH (my favorite!!!). The lipstick comes in usual regular abstract designer carton box which is a signature packaging of Sugar cosmetics. The lipstick comes in a cute small square shape case. 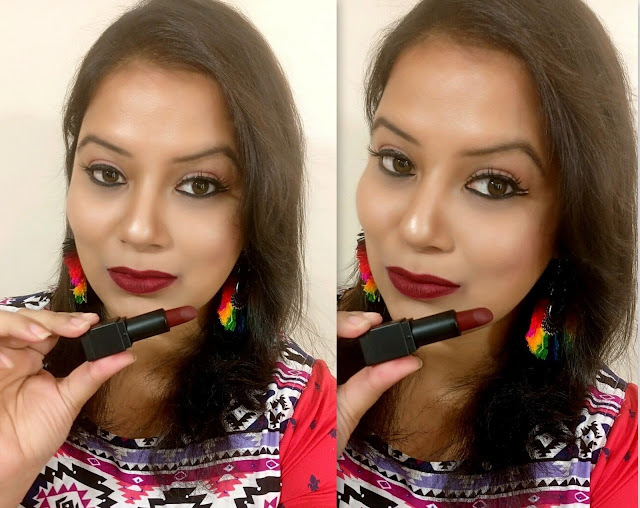 The bullet of the lipstick is quite a lot as it has 3.9g of product. The lipstick case closes with a ticking sound and it stays securely in the bag during traveling. The shape of the lipstick is so nice that it holds a very small space in the stash. 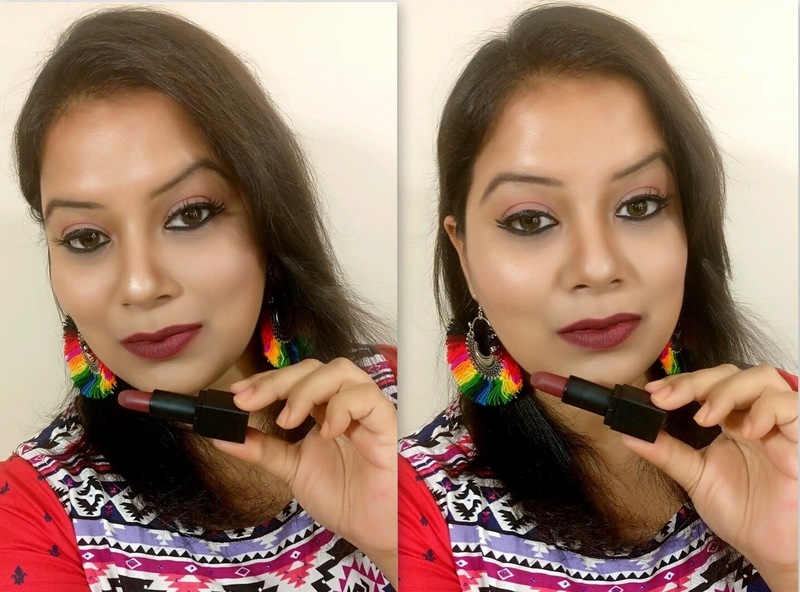 Sugar cosmetics is one brand who never disappoint me till now and so when they launched a new line of matte lipsticks I could not stop myself and grab all. 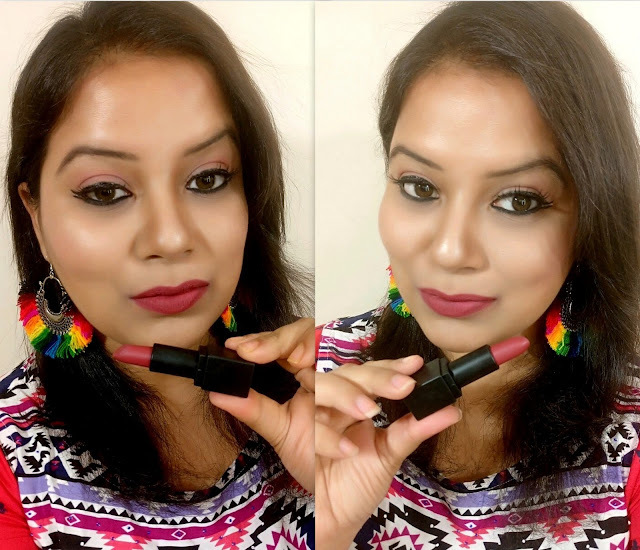 As I am a huge fan of matte lipstick and so previously I grabbed almost all SMUDGE ME NOT LIQUID LIPSTICKS OF SUGAR COSMETICS (reviewed here and here ) so when Sugar cosmetics launch another line of matte lipsticks I couldn't resist myself. The lipsticks are super pigmented. They have a velvety smooth texture for which they glide super smoothly on lips without any tugging or pulling of lips. 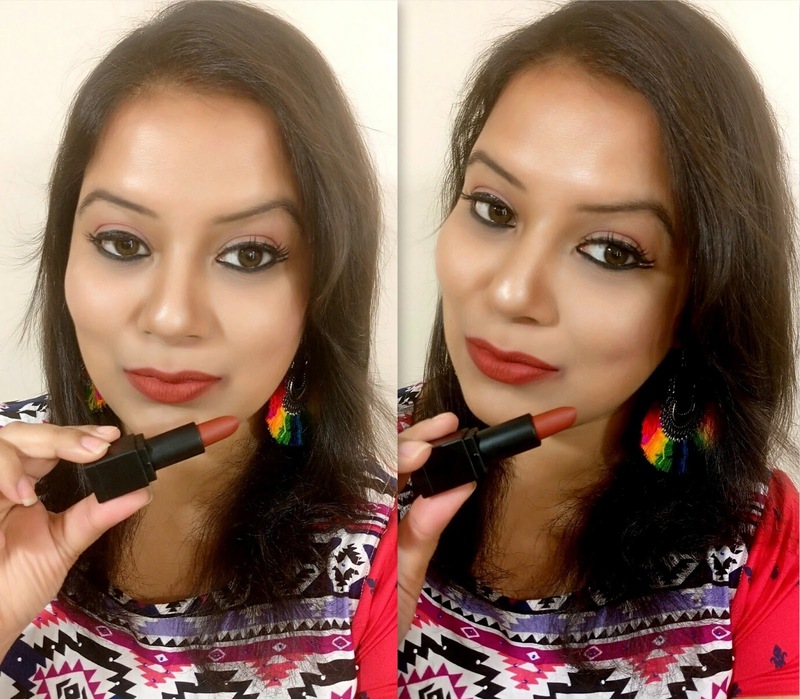 Both the lighter and darker shades are very pigmented but the darker shades are insanely pigmented for which they stain heavily on lips (which I just love it! ). 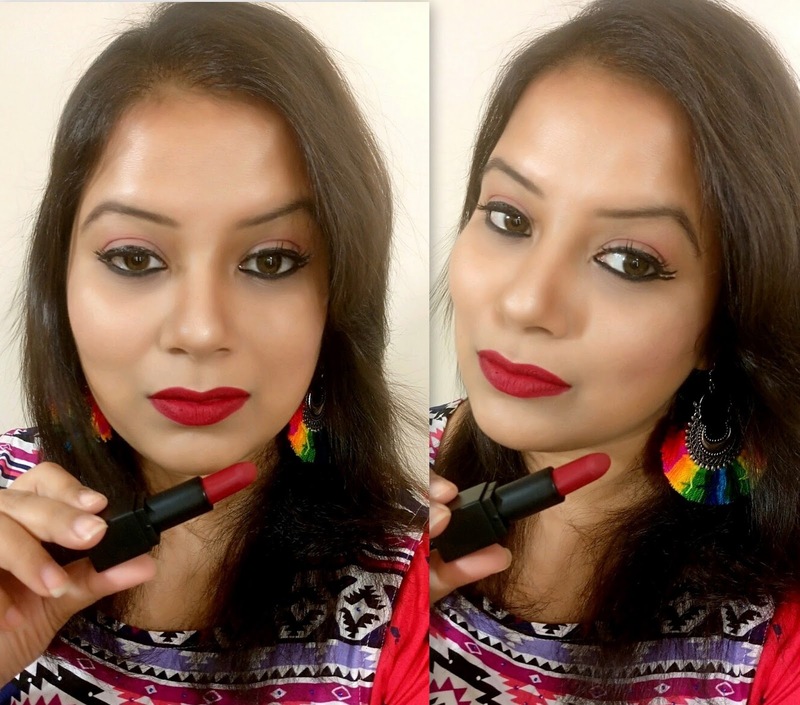 The lipsticks can easily hide any pigmented lips and give an opaque coverage in 1-2 swipes. 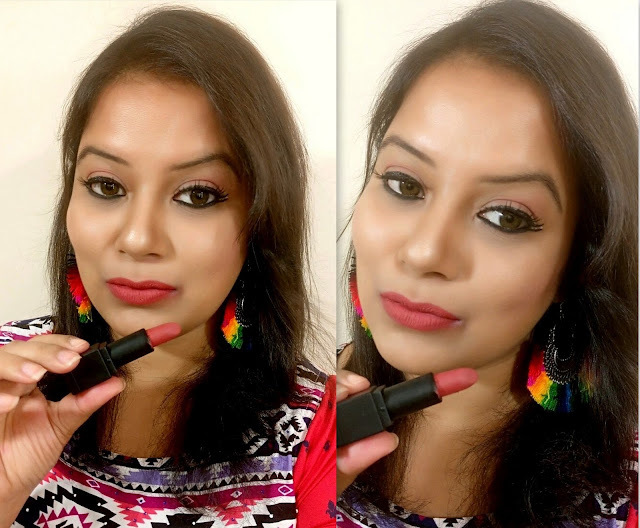 These lipsticks transfer a little bit after few minutes of application but it turns transfer proof with hours. These lipsticks are not over drying on lips neither they turn patchy or streaky with time. In short, I am super impressed with the quality of these lipsticks as they pretty affordable and worth buying in every way. So which one you like it?